27 Ocak 2015 tarihinde yayınlandı. We have been organising our 4th International Action Year in a time of crisis and nonconventional warfare at global level. However this will not constrain us from taking to the streets and strengthening our international movement. Confronting with this capitalist, patriarchal and colonialist system, we will expose and denounce all forms of violence against women and identify the actors promoting oppression, namely fundamentalist religious groups and sectors and neoliberal, multilateral and financial institutions and governments destroying social services and rights. We will make the resistances already existing everywhere visible and develop alternatives to today’s dominant accumulation model based on appropriation of nature, control over women’s bodies and lives, appropriation of rights, violence, militarisation and criminalisation of social movements. We will show the World that as women we have power to change and alternatives to share. 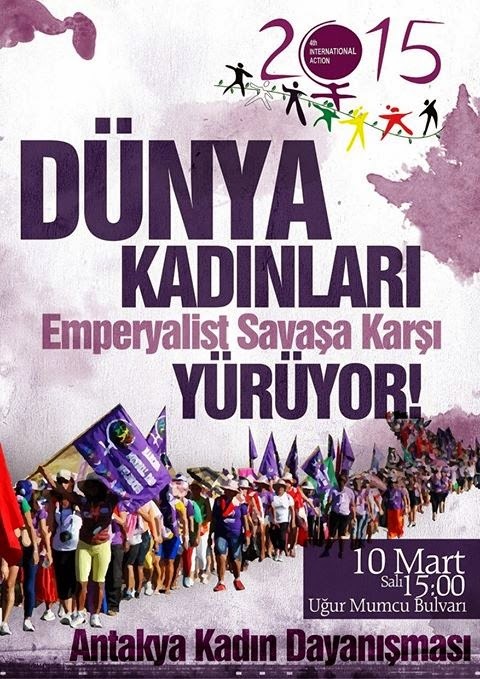 Feminists from all over Europe and the world will gather on 8 March 2015 in Kurdish territory of Turkey for the launch of European Caravan as part of the 4th International Action of the World March of Women. European Feminist Caravan is to launch from Turkey on 8th March and after crossing Europe from one resistance place to another it will reach its final point in Coimbra (Portugal) on 17th October 2015. Popular feminist training, as an ongoing process which enables us to recognize our power to act and to be, independently from the system, and to learn and to build a world for women, communities, and nature with others, is a part and parcel of our 4th International Action Programme. As it is seen this action programme includes wide range of activities from public debates to forums, from musical and theatrical forms to reinvention of history and culture of humanity. You may bring feminist books for Women’s Academy in Diyarbakır and preferably English books for women’s libraries in Kobane. Do not forget bring seeds with you! The 4th International Action Program starts on 6th March 2015 Friday at 9:00 am in Nusaybin (one-hour distance from Mardin), therefore arrivals should be at Mardin Airport preferably before 6 March. There is airport in every city where our caravan will pass through: Mardin, Diyarbakır, Antakya, Antalya, Muğla and İzmir. According to your availability you may arrange your return from one of these cities. For international and national delegates, we arrange buses from Mardin to Thessaloniki. They will be free of charge. It will be organised separately from our action programme. In Mardin and Nusaybin we will stay in houses where hosting women cook traditional foods. But for those who ask hotel accommodation, affordable hotel lists will be provided soon. In some places we will stay in affordable hotels but solidarity accommodation will be available in case of need. After receiving registrations we will send you detailed programme and practical information. Foods also will be offered by local women who host our actions.